What do you understand by the term Computer Logical Organization? Abstraction has different levels, and the level that above the digital logic level and below the operating system level is the level named as Computer Logical Organization. The functional units and the subsystems related to the hardware that is built from the building blocks constitute the major components of Computer Logical Organization. 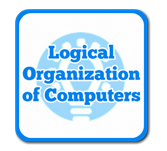 The tutorial provides detail understanding of the concept of Computer Logical Organization. Who are the audience for learning the concept of Computer Logical Organization? The concept of Computer Logical Organization is mainly targeted for the students who aspire a degree in Computer Science. The tutorial facilitates the students to better understand the concept right from basics to advanced topics related to Computer Logical Organization. What are the prerequisites required for learning Computer Logical Organization? Basic knowledge and understanding of the concepts of fundamentals of Computers and understanding of the basic concepts like Keyboard, primary memory, secondary memory, monitor, mouse, input, output are required for learning Computer Logical Organization.